Protein Fractionation filtration removes suspended particulates, dissolved organics, proteins and tints. At the same time, protein fractionation lowers bacteria and pathogen concentrations, while saturating the water with oxygen. 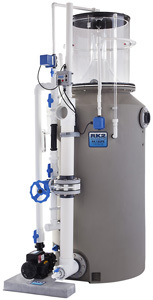 Traditional water filtration systems, (i.e: pressurized sand filters, bead filters and cartridge filters), remove particulates but are ineffective against dissolved wastes and act as breeding grounds for bacteria and pathogens. Water that is filtered through traditional filters is constantly sieved through the trapped wastes. Similar to that of a tea bag, this action leaches bacteria, dissolved organics and tints back into the water. The media in the filter functions as a bio-filter, promoting bacteria, which in turn strip out oxygen. Consequently, the discharge from these filters is generally enriched with bacteria and dissolved organics as well as having reduced oxygen concentration. The fractionation filtration process is simple and highly effective. Air, (in some cases ozone as well), are injected into the bottom of the reaction chamber via an ozone resistant venturi injector. The water to be filtered is introduced at the top of the chamber and exits at the bottom. This creates a mass mixing effect, with the water traveling cross current to the air, which is essential for the effective formation of foam. The foam rises through the column and becomes more concentrated as it passes into the upper rise tube. The tube allows for the water to drain back into the tank via gravity, while the concentrated foam is ejected over the top of the riser tube and collected into a waste drain. The upper chamber is automatically washed down with rinse systems that keep the surfaces clean and prevent the foam from drying and inhibiting the ejection process. Ozone Injection enhances the fractionation process in a number of ways. Ozone oxidizes various pathogens, from bacteria to viruses. Ozone is extremely effective on organic water tints creating crystal clear water. Ozone also breaks down the structure of larger organic molecules, which facilitates their removal by fractionation. Being a three-part oxygen molecule, ozone dramatically increases oxygen concentration. Ozone in doses appropriate for aquaculture is very safe. The fractionation and ozone combination is extremely effective in a variety of applications. Grow out tanks and aquaria displays with heavy bio-loads become remarkably cleaner. Clean Systems, such as larval rearing or holding tanks can become crystal clear. Protein fractionation with ozone is excellent for systems with heavy mucous concentrations such as closed or semi open finfish and shellfish holding systems. Other applications include purging systems, grow out systems, effluent treatment as well as influent water treatment for use within partial and full flow thru systems. The protein fractionation process increases water clarity and oxygen concentration, and also destroys and removes pathogens. Consequently, appetite, stocking densities, feed and growth rates are all enhanced and animal health improved. Used within aquaculture, live seafood holding as well as most public aquariums worldwide, protein fractionators are an essential component within any aquatic life support filtration system. Protein fractionation is effective in seawater, freshwater as well as brackish water systems, within partial or full flow applications. Individual models are available with processing flow rates from 3 to 2000 gallons per minute. For larger flow rate applications, our protein fractionators can be incorporated into any modular system design, thus allowing us to process any system volume where protein fractionation is required.